This has always been ‘Juan ‘O my favourite American Muscle Cars - ever since it was introduced as the 1996 Indy 500 Pace Car... As this first edition still remains my most favourite version and I can still vividly recall being passed in the rain going uphill on I-405 towards Renton, WA and being passed by a strikingly beautiful blue with twin white Le Mans striped Viper GTS coupe! And I also recall getting passed by three of these ‘beautes on my way into Laguna Seca, or was it Portland Int’l Raceway? Having marveled at Viper Club gatherings at both venues in the past - which is perhaps why I’ve still got a Viper GTS Official Pace Car Magazine center spread advertisement tucked away in my Nostalgia folder, eh? 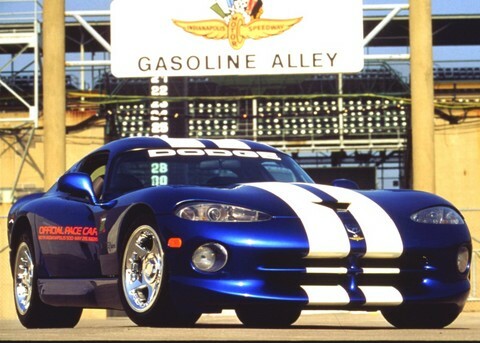 Not to mention having a 1:18 Diecast version of the Viper Pace Car.